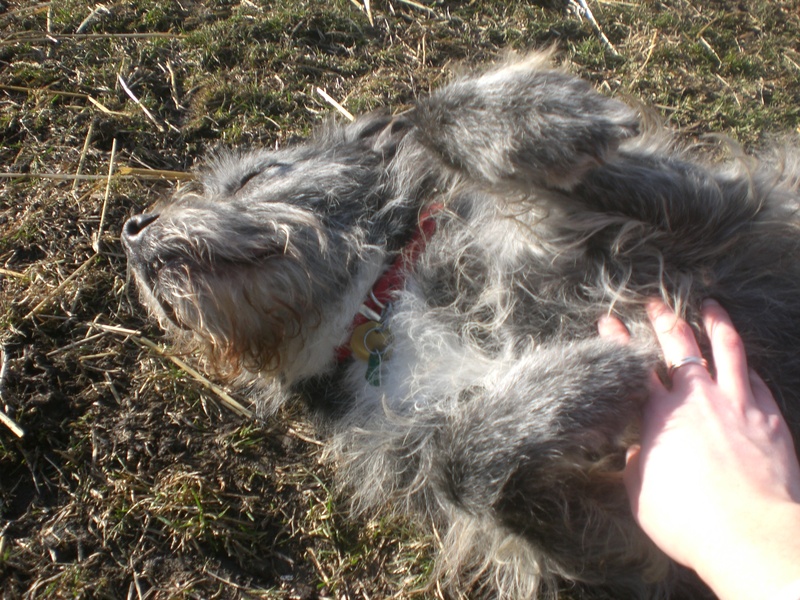 It was a beautiful, spring-like day today, and the dogs at the shelter were loving it! The shelter was busy, and as I was leaving it looked like one lucky dog had found a new mommy. Coco and Bear arrived at Orphans of the Storm® together just a couple months ago, and would be thrilled to find a new loving home together. They are best friends and playmates and spent the first five years of their lives in the same house. 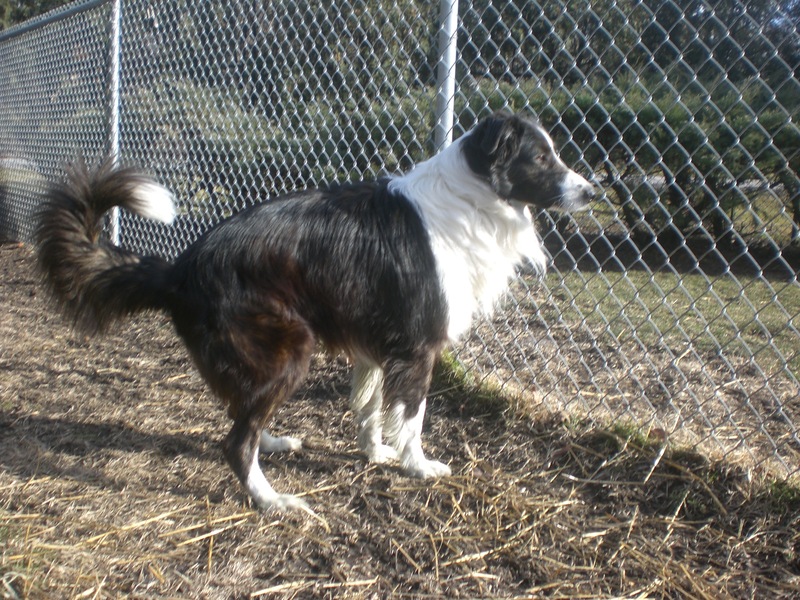 They are five-year-old Border Collie mixes and they are beautiful, sweet, well-behaved dogs. Bear and Coco make a such a cute couple! I don’t have much experience walking two dogs simultaneously (just when I took Mink and Puggie out together), but these two were pretty easy to manage. The leashes got a little tangled a couple times, but overall they enjoy walking next to each other and stopping to sniff the same things. They can be playful, which is why it’s good they have each other. They chased each other around the run, yipping happily at the chance to get some exercise. 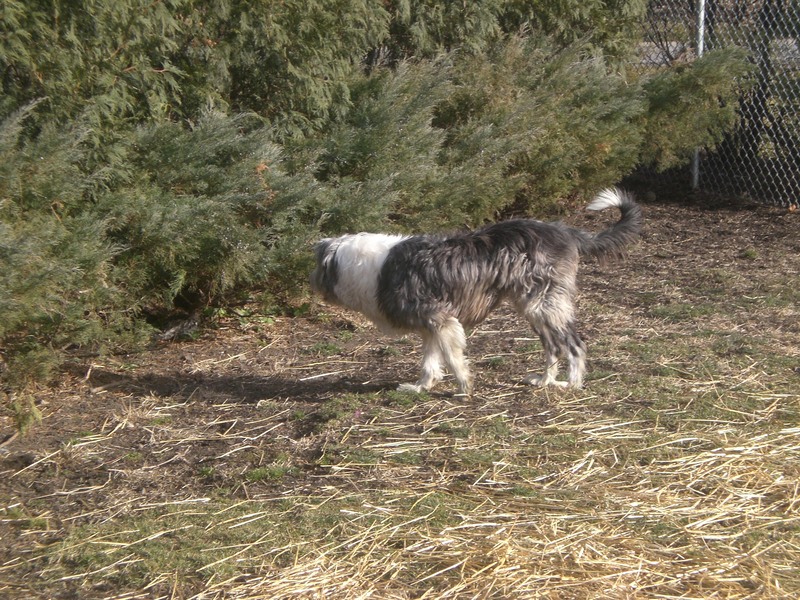 Bear would stay on one side of the bushes and Coco stayed on the other; they watched each other carefully through the branches and mirrored each other’s movements until Bear would make a break for it and Coco went running after him. These two best friends would love to add another companion (or an entire family!) into their lives. 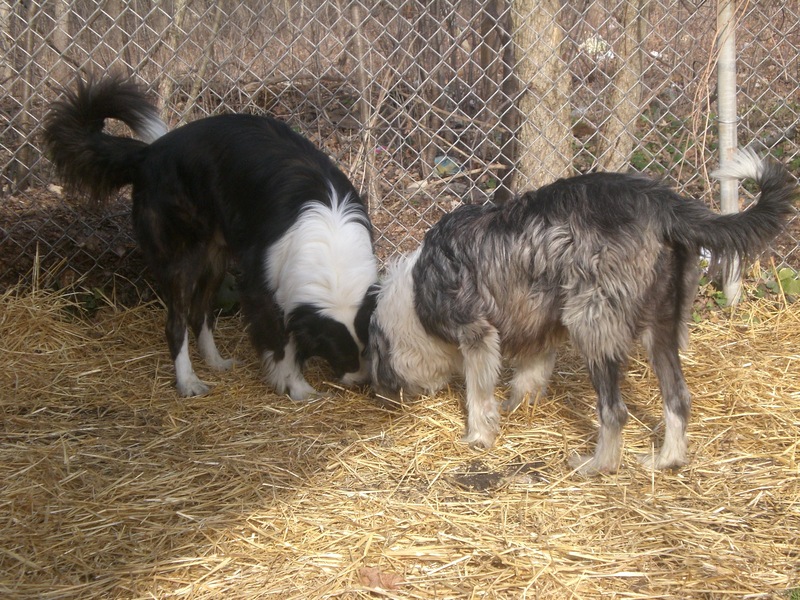 Who wouldn’t want two wonderful Border Collies by their side? 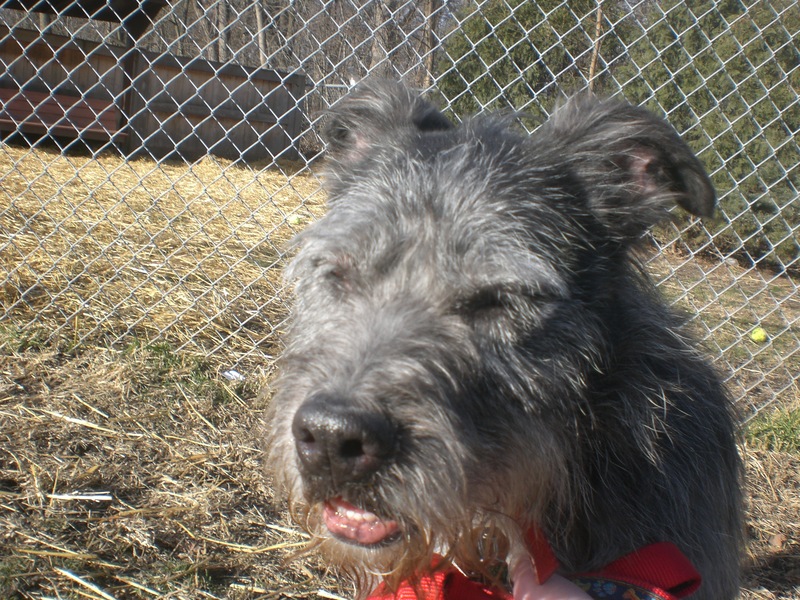 Bobo the three-year-old Wired Hair Terrier mix is the dog I was originally drawn to on my very first visit to Orphans of the Storm®. He is a real cutie. Since I’ve started to make my way through the long-timers and old-timers at the shelter, I thought it was finally time to get to know Bobo. 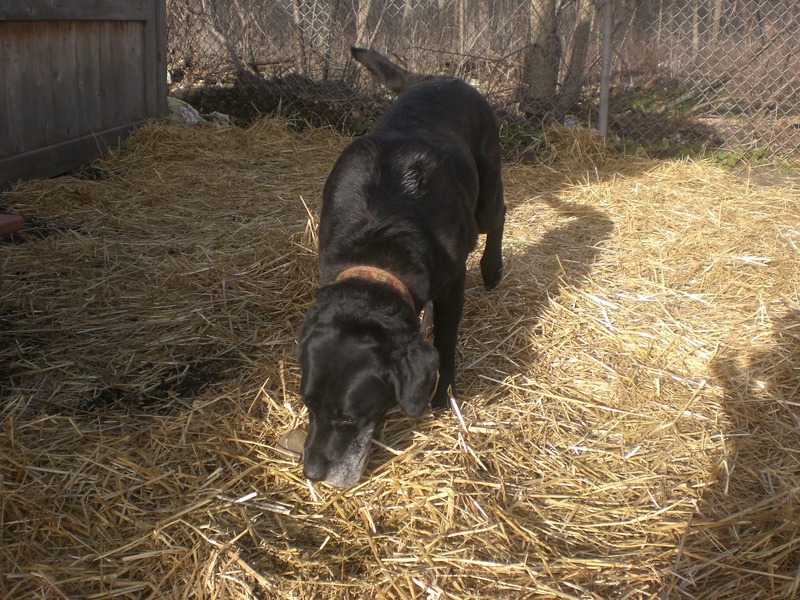 Please do not immediately walk past this dog just because he barks from inside his kennel. As soon as he was out on the leash, a peep didn’t come out of him. 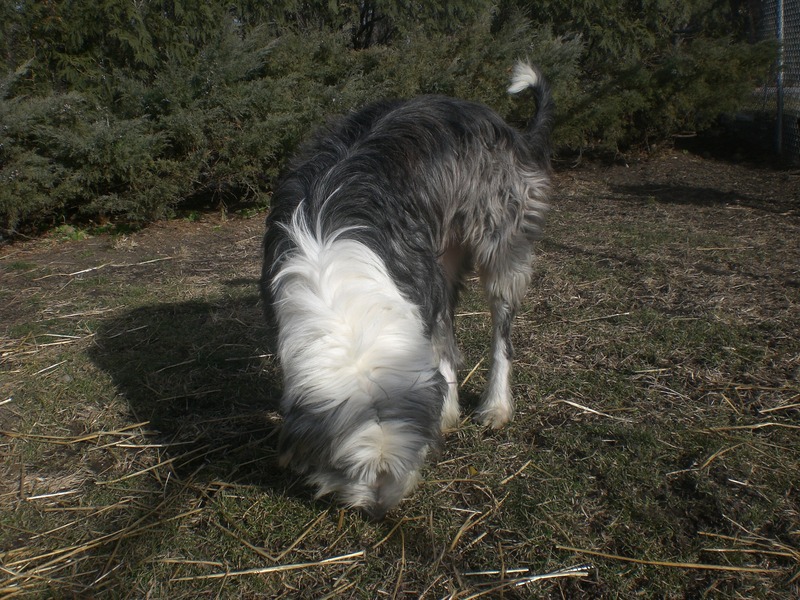 He didn’t pull on the leash as we made our way to the run—it was more me encouraging him to keep moving because he wanted to stop and sniff everything with that terrier nose of his. 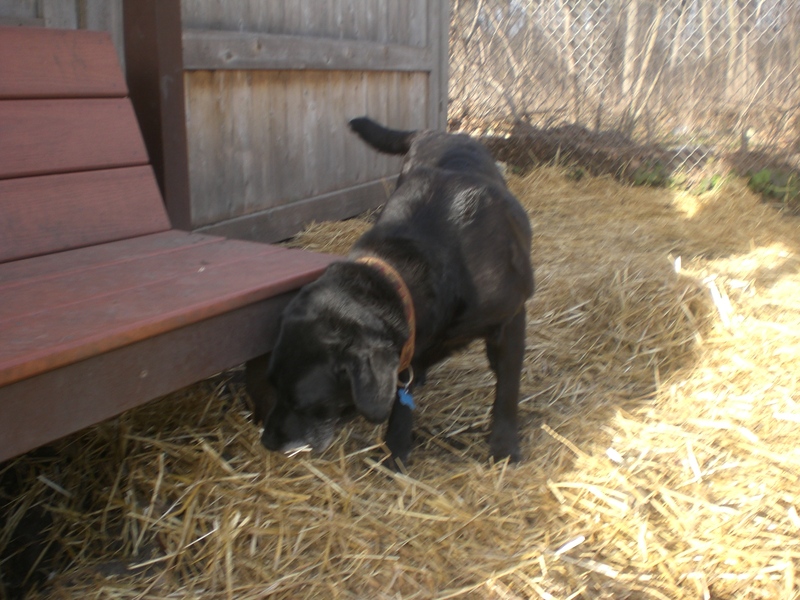 Once we were inside the run, the sniffing continued. I followed him around for a bit and then knelt down, and he stood next to me as I pet him. After a few minutes, he decided he was enjoying himself and sat down so I could continue petting him. A few minutes after that, he rolled over for a belly rub. That belly rub lasted about fifteen minutes, and Bobo’s face was the picture of contentment. Especially in the warm sunlight, he looked like he could’ve stayed there all day. It broke my heart to tell him that we had to go back inside. 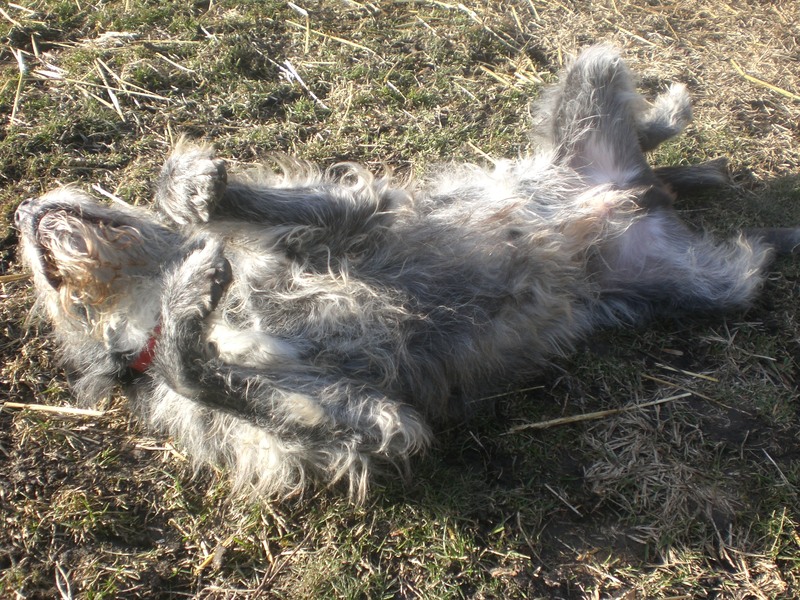 Even after I stood up and stopped rubbing his belly, he stayed on his back and looked at me, like, “Wait! Why did you stop?” This guy is just too sweet. All he wants is someone to give him the attention he deserves. 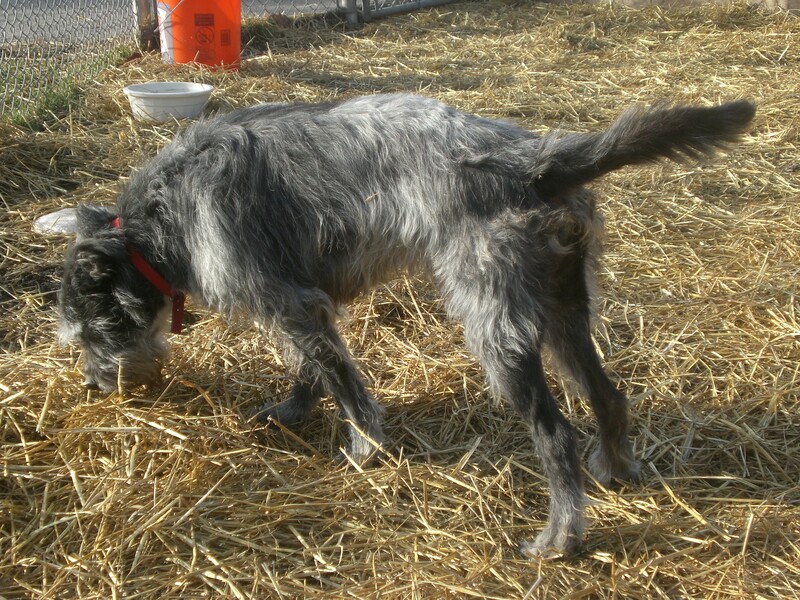 Give Bobo a chance and get to know him outside of the kennel. Bobo wondering, "Why did you stop rubbing my belly?" Last for the day was Rosemary, a nine-year-old newcomer to the shelter. 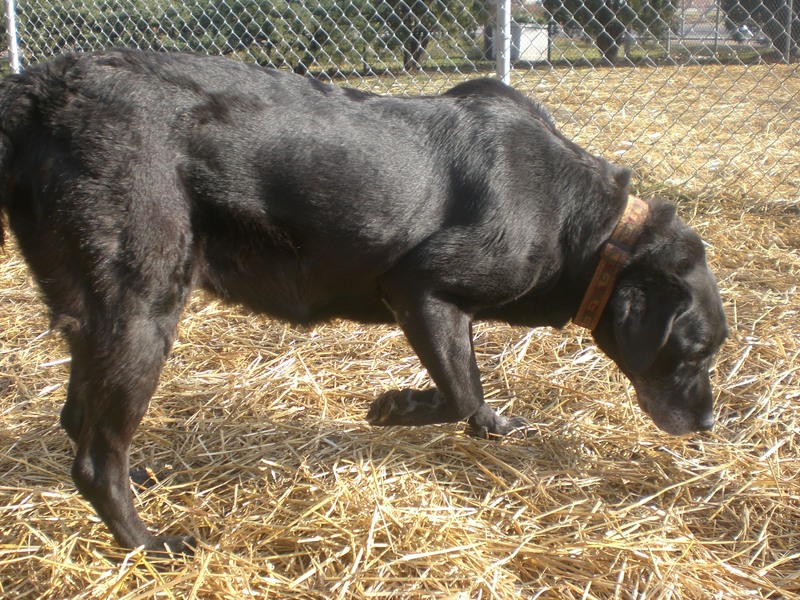 She is a black Labrador Retriever mix and very friendly, as Labs are known to be. She jumped up a few times as I was putting her leash on as a greeting, but once we were out in the open the jumping stopped and she did well on the leash. Even though she’s nine years old, she would still like to get enough exercise to stretch her legs. Once she’s had enough exercise, she’ll be thrilled to curl up next to you and receive all the petting and praises you can offer. Rosemary sat next to me while I was on the bench and I found a tickly spot on the right side of her neck. She enjoyed getting her back and ears scratched as well. Don’t count this sweet girl out just because of her age. She still has lots of doggy love to give, and wants to share it with a new family! 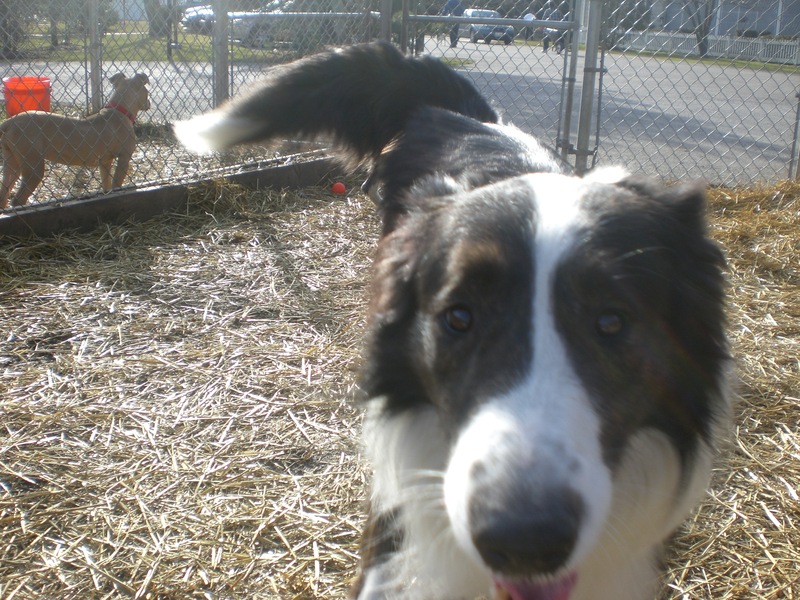 Posted by Meet the Pooches on January 7, 2012 in Dog Profiles and tagged adoption, animal shelter, Border Collie, Chicago, dogs, Labrador Retriever, Orphans of the Storm, pets, Terrier. i was Bear and Cocos previous owners. I miss them to death! i hear they were adopted back in the spring. i hope they are doing great! They are both wonderful dogs! I’m sure their new families love them very much.